The Litom outdoor solar lights are unlike anything else we have seen. These and the lights that sit at our #1 spot are very similar, but with a few differences. Right now, they hold a 4.4 rating on Amazon. It used to be 4.5, so they must have gotten a negative review in the time since we published the ultimate buyers guide for the best outdoor solar lights. Either way, let's see why we put these in our top two. First thing we have to touch on is the unique shape and design of these lights. They are far bigger than any of the compact solar motion sensor lights we have featured before. These size in at 6.1 x 4.1 x 1.8 inches. they are much wider than any we have seen before. They have the solar panel on the top slant, with lights on the bottom slant as well as the sides. This gives a lighting angle of 270 degrees. Speaking about the light, this fixtures includes 24 LEDs that have a total output of 500 lumens, maybe more. That is by far brighter than many we have reviewed. Plus, due to the design of the light, it has 18 LEDs facing downwards, with three on either side that light outwards. This gives it a wide angle of light, allowing it to provide more coverage. Unfortunately, there was not information about the battery capacity, only that it was a 18650 lithium ion battery. However, users have reported that on its dim setting, they easily last all night. At their full brightness, they last between 4 and 6 hours. Not horrible, but the lower active time for full brightness either means a smaller battery or inefficient solar panel. About the solar panel. Surprisingly, there is absolutely no information mentioned about their solar panel on their Amazon page. This could mean that it is a very cheap or inefficient solar panel, which would account for the shorter full bright active time. However, I do not want to jump to conclusions. Without the actual information, there is just no way of knowing. The body material is something Litom is quite proud of in their Litom Outdoor Solar lights. It is made out of high-impact ABS material. It is a material that can be heated and cooled repeatedly without undergoing destruction. On top of that, it has a waterproof rating of IP65, instead of 64, for added protection. So, if this thing falls, gets stuck in a blizzard, a heat wave, hurricane, whatever, it will survive virtually unscathed. That is pretty impressive. However, here is probably the most impressive part of the Litom outdoor solar lights. They have three, that's right, three lighting modes. Not only do they have a full brightness setting, and a dim light/motion setting. They also feature a pure motion sensor setting. Many motion lights either have the first two or the last setting, but they rarely feature all three. So this is very very nice to see. Besides that, the motion sensor is fairly basic. It has a sensing angle of 120 degrees and it can detect motion up to 26 feet away, which better than the norm. it is quite obvious from their website, that Litom is based out of China. However, that seems to be the only information they provide. 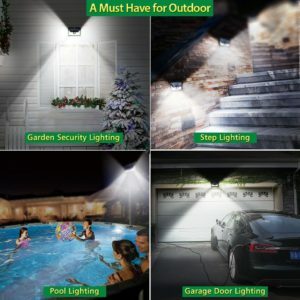 Their "About Us" section of their website literally reads "LITOM is the leading solar powered motion sensor light brand based on Amazon. And LITOM focuses on making customers have better experience with our products." Obviously translated from Chinese as there are some grammatical mistakes here and there. Beyond that, we have no idea when they started up, or much else. We do know that they produce solar lights and other various models of lights. The Litom outdoor solar lights have a very impressive lumen output. The exact output is 526. This ensures that you receive plenty of light throughout the night. The unique design that these lights have makes it so there is a very wide area of light that it can cover. Not only do they have 18 LEDs facing downwards, but they also have 3 on each side to provide light outwards. The body material is highly durable. The high-impact ABS with a plastic finish makes sure that it can withstand anything that is thrown at it. Plus the IP65 waterproof rating makes sure that whatever weather it is in, it will come out swinging. Three lighting modes. THREE! Full brightness, dim light with a motion sensor for full brightness, AND just motion sensing. So whatever you need these lights for, they can handle it with ease. The motion sensor is very capable. Not only capable, but good. It can detect motion from 26 feet or closer, with the standard angle of 120 degrees. Perfect for placing above a garage door. While no information was provided for the battery, it apparently has a decent capacity. On it's dim light setting, it can easily last the entire night. With the motion sensor setting making it last even longer. There was no information regarding the solar panels. This could mean that they are inefficient models, meant to keep the overall price of the fixture down. On its full brightness setting, the lights only last between 4 to 6 hours. This is very low and could be the result of smaller battery capacity or inefficient solar panel. Maybe both. There have been various customer complaints about their fixtures malfunctioning over time or arriving broken. These could be isolated incidents, or reoccurring situations. Hopefully the first. These lights are crazy. The 526 lumen output, combined with the light coverage and the highly durable body, these lights are pretty great. However, the lack of information provided for their solar panel and battery may be a cause for concern. If you are one to play to to the vest more often, then you may want to pass on these. However, if you are confident with the information given along with customer reviews, then go for it. If you are confident in the information given by Litom for these outdoor solar lights, then we recommend that you go for it. While there is some important information missing, the information we were given is very impressive. It is unlikely that they would make the entire light of high quality except for the battery and solar panel. However, it is possible. Regardless, you can pick one up on Amazon for $17.99, which is very cheap for this level of craftsmanship. For more information about the other top 10 best outdoor solar lights, visit Green and Growing. Here are some top questions that I found for people seriously considering buying the Litom Outdoor Solar Lights. Is the light off until it senses motion or is it always dim at night then get brighter with motion? Yes, it is off until it senses something. Where is the on/off switch? The switch is on the back. The 4 modes are off, high light, low light, and sensor. Can you mount this sideways, going up and down? You can, but the top panel must be in the sun for it to function.